As a cardinal rule, most sequels fail to deliver. Writer/director James Gunn’s follow up to Marvel’s 2014 release of “Guardians of the Galaxy,” “Guardians of the Galaxy Vo. 2” delivers in virtually every single department. From the opening scene, Gunn somehow replicates what made the original one so great. The start of the flick involves The Guardians (Star-Lord (Chris Pratt, the knucklehead bully of Drax (Dave Bautista), Gamora, (Zoe Saldana), Bradley Cooper as Rocket Raccoon and Vin Diesel as a talking tree named Groot, who says only three words: “ I am Groot.”, fighting a monster from another world. They have to retrieve a thief Nebula (Karen Gillian), Gamora’s (Saldana) sister who was stealing from Elizabeth Debicki’s Ayesha. She is part of the Sovereign race, a gold-hued species that has a high opinion of themselves. The opening scene alone is a joy to watch, since Baby Groot (Diesel) is dancing around without a care in the world. His character of Baby Groot is just happy to be alive. He is just dancing to the beat of the song. A portion of this opening is shot in slow motion, adding to the effectiveness of the scene. Part of the plot twist with “vol. 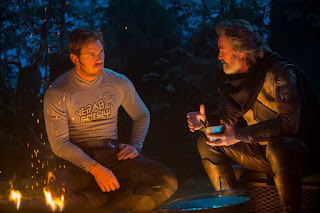 2” looks at the relationship between Ego (Kurt Rusell) and Star-Lord (Pratt). For all intents and purposes, he is Quill’s father. Also involved is Mantis, an alien that aids in Ego’s sleep cycle. Also of note is the relationship of Michael Rooker’s blue-hued alien thief Yondu, because he had a falling out with Sylvester Stallone’ Stakar Ogord. The relationship between the duo went south at some point, and Yondu is oblivious to the fact he slighted him in some way or form in the past. What was really cool in this entry is the family dynamics between Gamora and Nebula because the latter has a firm disdain for her elder sister. The duo always seem to be adversial, because Nebula always seems to be left in the wind with no one to help in her struggle. Also amusing was a character named Tazer Face, because he did not realize how dumb that sounded when said out loud. That is just one of the few moments that stand out on a chapter that continues to impress in a series that will bring forth nothing but cheers and pleasantries for everyone and all to enjoy.